There has been plenty of activity since Edmund’s last newsletter, not all of it welcome. Those of you who are parishioners of St Mary’s and St Thomas’s will know that we have had to say farewell to Fr Richard who has departed for a sabbatical followed by a fresh challenge around Easter. There is a tribute to Fr Richard in my report for the AGM which accompanies this newsletter, and an article on page two, by Edmund, describing the parish party, they speak for us and the parish, so I will say no more. Edmund was recalled from retirement as editor of the Newsletter to record Fr Richard’s farewell party. So far we have been unable to replace Edmund. This Newsletter is a composite from committee members drawn together and edited by a member of the Friends, Clare Flanagan. Thank you Clare. Any would be permanent editors please volunteer soonest! At the AGM, Pat Prendergast and Robin Williams retired from the committee and I should like to record our thanks for their work and support over the years. We extend a very warm welcome to our two new committee members Helen Clift and David Tetlow. As you will see, we have a full (and ambitious) programme of fundraising - and fun - for 2004. Please, please support these functions, and bring your friends. There is a proforma with this Newsletter to enable you to purchase tickets for the Fashion Show. It promises to be an entertaining evening. It is already clear that Rackham’s has considerable expertise in this field. If anybody fancies treading the catwalk or can offer behind the scenes assistance we - Gerry 01793 750107, Bernadette 01285 861586, Philippa 01367 252835 or Helen 01285 810172 - would be very pleased to hear from you NOW. Finally, may I thank you for your continued support and remind those of you who have not paid your annual subscription that it is now due. I look forward to seeing you at our functions. The founder of The Friends of St Mary’s Church could not be permitted to disappear over the horizon without a suitable memento of his activities in Cricklade. On Tuesday 6th January, the feast of The Epiphany, the evening Mass at St Mary’s was offered for the Intentions of The Friends of St Mary’s. At the end of the Mass Fr Richard was presented with a beautifully executed and accurate painting of St Mary’s Church commissioned from Lin Collier of Lechlade. There will be no excuse for forgetting us! As many Friends will know, Fr Richard, who has served as parish priest to St Thomas of Canterbury at Fairford and St Mary's at Cricklade, as well as the Catholic community at Lechlade, has moved on to pastures new. The Friends recognised his particular contribution to St Mary’s at a special Mass (reported on page one). However, we couldn't let the opportunity pass to let Friends also know about the splendid send off he was given by the whole parish, and his many friends in Fairford, Cricklade and Lechlade at a social evening at Down Ampney Village Hall on Saturday 3rd January. It seemed like the whole parish was there - more than 150 people were entertained splendidly by the Music Group, challenged with a quiz, and fed wonderfully by many volunteers who provided cheese, wine, biscuits and dips of all varieties. At his particular request, contributions to Fr Richard's leaving gift were to be donated towards the new window to be installed in St Thomas’s in Fairford. This will be in thanksgiving for the founders and benefactors of the parish. Manus Moran, Chairman of the Pastoral Council, was able to report that £2,600 plus had been raised: a fantastic achievement. The evening was rounded off by the Music Group leading us all in a rousing chorus of 'Auld Lang Syne'. From teenagers to the more mature woman. Sizes 10-18. Everyday clothes and evening wear. Make-up demonstration with “goodie bags”. Tickets £6 to include refreshments “Cheese and Wine”. To reserve your seats fill in the tear off slip on the back page of this newsletter. £7.50 to include hot or cold supper. Individuals, pairs, foursomes and teams of eight. Form your own team or join forces with others. Bar. Celtic bishops and teachers, to urge them to cement Catholic unity. They are reputed to have met at a place near here, since called St Augustine’s Oak, and St Augustine is believed to have healed a blind man at Lertoll’s Well near Cricklade. The site is between Latton and Eysey. This is how St Augustine, the first Archbishop of Canterbury, came to be associated with Cricklade. When the Catholic community in Cricklade purchased the Baptist chapel in Calcutt Street, Cricklade, in 1955, it was decided that the tradition of St Augustine’s meeting in this area be kept alive by dedicating the church to St Augustine. should revert to a place of prayer. It is not known whether it was ever dedicated to Our Lady or perhaps to a Saint and there are no records to inform us. 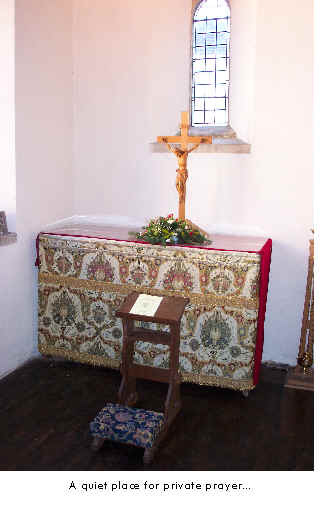 On 1 January 2004, 20 years after the first Mass in St Mary’s since the Reformation, the chapel was re-hallowed and placed under the patronage of St Augustine of Canterbury, thereby keeping alive the tradition of his visit and linking St Mary’s with our previous church in Cricklade, St Augustine’s. The chapel is available as an oratory or quiet place for private prayer and devotion. A beautifully inscribed record of the incumbents of St Augustine’s and St Mary’s is displayed in the chapel. Contact us if you would like to help with any of our functions - we need supporting staff at the Fashion Show, church sitters on 29th May and 11th September, and catering help for the Quiz Night. Please forward………………..tickets for the Fashion Show @ £6 each. I enclose a cheque for ……………………….